The Linux Foundation’s OpenDaylight project announced their first official release today, codenamed Hydrogen. Hydrogen is the result of several months of concerted effort by developers both independent and from a variety of network vendors contributing to the project. From my perspective, the significance of Hydrogen is the demonstration that the open source model of creating software can work even when competitors are required to work together. 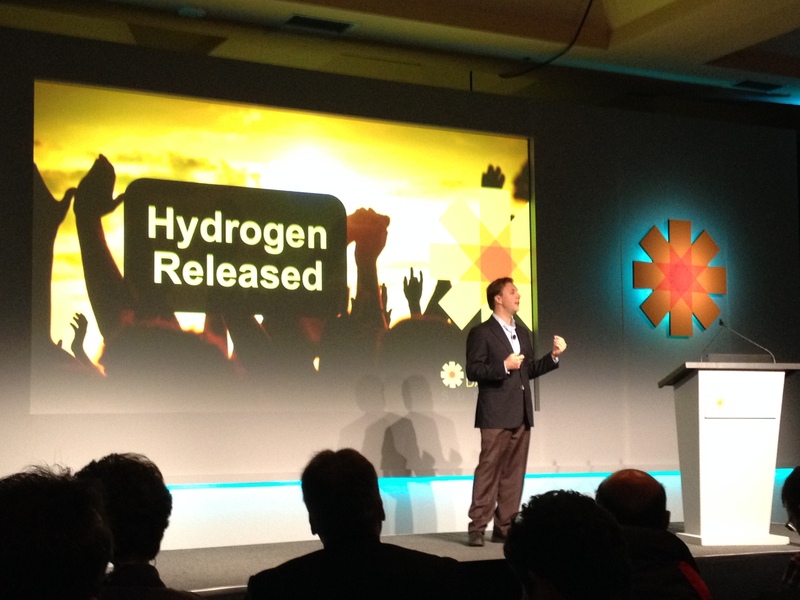 Neela Jacques announces the immediate availability of Hydrogen at the OpenDaylight Summit. Moving aside the politics and drama that’s been a part of ODL since its start, what does ODL’s first official release actually mean for network engineers? In my opinion, several things. Software defined networking (SDN) is the real deal, with a future and everything. If NEC’s ProgrammableFlow, VMware’s NSX, Cisco ACI (and related initiatives), OpenFlow’s continuing evolution, the non-stop clamor regarding network virtualization, network functions virtualization, controller architectures, discussion around northbound and southbound APIs, the plethora of networking startups, acquisitions, spin offs, and spin-ins, and just general industry fervor surrounding SDN hasn’t convinced you that SDN is actually a thing…well. It just is. Even if you don’t see exactly how SDN is going to impact your network today, know that it will eventually. And that’s true if you’re a service provider or enterprise, large network or small. Proprietary, vendor-specific SDN is not viable for the industry long-term. While there are a number of groups working on SDN standards, we’re a long way from SDN meaning something universally agreed upon. Various vendor approaches have come to market, solving different problems in different ways and targeting different customers and use cases. Customers have to know both what they want and what a vendor is actually selling them to make “vendor SDN” work for them. Hydrogen offers a common SDN baseline for both customers and vendors to work from. While Hydrogen isn’t where SDN is going to stop, it does provide that foundation upon which other SDN approaches can build. Indeed, I heard plenty of discussion about this at the OpenDaylight Summit today – we’re going to see vendors releasing their own distributions of OpenDaylight. Organizations can experiment with SDN without making a vendor commitment or engaging in a vendor sales cycle. In fairness, there are other open-source SDN related projects. I’m not claiming that Hydrogen is a first in that sense. But I’ll point out that OpenDaylight offers an integrated set of SDN applications built around a modular controller infrastructure, all available for free, and supported by a growing community of open-source developers, many of whom are backed by the full power and commitment of industry vendors. To me, that makes Hydrogen far more than an academic experiment or one-off project. Hydrogen is the first iteration of an SDN project meant to be taken seriously by the industry at large. Let’s say you’re interested in SDN, and want to give Hydrogen a try. You can download Hydrogen from here. There are three editions to choose from. The Base Edition is the one to get started with; the other editions build on this one. The core service abstraction layer is here. On southbound side, there’s an OpenFlow plugin for 1.0 & 1.3, along with OVSDB. So, you can manage anything OpenFlow compatible, as well as OVSDB virtual switches. On the northbound side, there are just basic services such as the topology manager and host tracker applications. The idea behind the Base Edition is to boot, connect it to something like the Mininet network emulator, and manage an arbitrary virtual topology. The Base Edition is not really for production, but rather intended to give folks a way to “kick the tires” of OpenDaylight. The Virtualization Edition builds on the base edition by adding a number of applications intended for a virtualized data center. Virtual Tenant Network builds a multi-tenant network using OpenFlow to program each physical switch in the network. The VTN assumption is that the network infrastructure supports OpenFlow, which many network switches may not. OpenDOVE allows for multi-tenancy using overlays (tunneling using VXLAN in this case) instead of OpenFlow. Other features of the Virtualization Edition include OVSDB, a Neutron REST API service (tying Hydrogen directly to OpenStack), a DDoS mitigation tool called Defense4All, and Affinity. Affinity for ODL is the open implementation of Plexxi’s traffic prioritization algorithm that works across any sort of fabric, not just a Plexxi optical fabric. The Service Provider Edition builds on the Base Edition, and includes Affinity & Defense4All. Additional features includes BGP PCEP, which gives SP’s the ability to manage their path computation requirements via a centralized BGP controller. The LISP flow mapping service supports NFV application service chaining: the LISP flow map becomes a traffic “steerer” moving traffic from service to service (which I think is a really interesting application of LISP – I need to look into that one some more). The SP Edition also includes SNMP4SDN. As the name implies, SNMP4SDN gives administrators the ability to manage their legacy gear via SDN. The idea is that if your infrastructure doesn’t support OpenFlow, you’ve still got a mechanism to perform flow management across your infrastructure. Hydrogen is helping to bring SDN to the network masses. Even though Hydrogen is essentially “1.0,” I’m going to be giving it a serious look, as I have an interesting network virtualization challenge I’d like to wrap an application around. I think OpenDaylight is a good place to start.